The external row Pinout headers (Pins from 16 to 47) are connected to the Intel® Braswell x86 Processor of the UDOO X86. 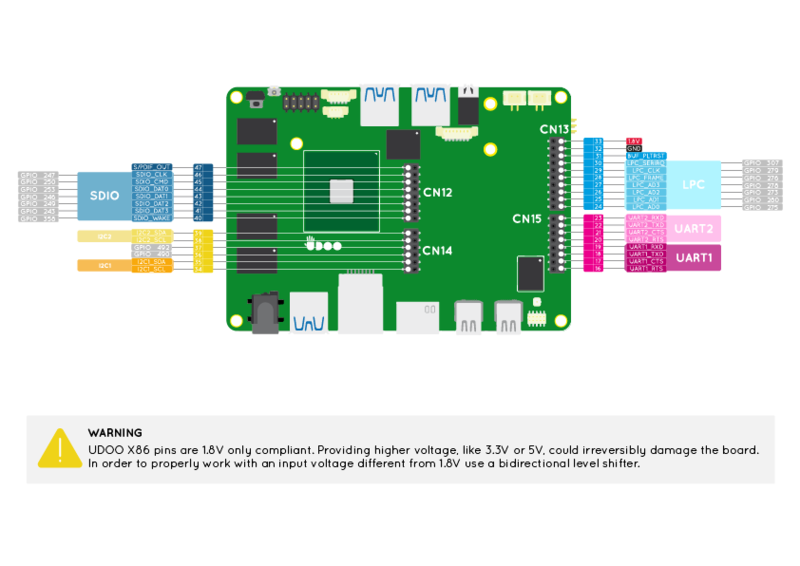 The image below shows the list of all possible functions assigned to each Pin. Universal Asynchronous Receiver/Transmitter (UART) provides serial communication capability with external devices through a level converter and an RS-232 cable or through the use of external circuitry that converts infrared signals to electrical signals (for reception) or transforms electrical signals to signals that drive an infrared LED (for transmission) in order to provide low speed IrDA compatibility. The UART 1 is available at Pins 16, 17, 18, 19. The UART 2 is available at Pins 20, 21, 22, 23. Both these serials are High-Speed UART (HSUART). Accordingly to the Braswell datasheet the baud rate goes from 300 to 3686400. These Pins can't work as GPIOs. The UART 1 and UART 2 are shown respectively as /dev/ttyS4 and /dev/ttyS5 when configured as HSUART mode(default configuration) or as /dev/tty0 when configured in Legacy mode. To use the UARTs in Windows, after enabling them in BIOS Setup, you need to download the corresponding drivers. Download and install the Intel Serial IO Driver. Then download the specific HSUART driver for UDOO X86. Verify the presence of Unknown Device with Device ID as ACPI\VCOM000x or ACPI\INT351x in Windows Device Manager. Extract the archive file, press mouse right-button on x64\UartSample.inf / x86\UartSample.inf (depending on the OS architecture) and select Install. On Device Manager, one or more UartSample Device devices will appear under "Port (COM & LPT)" section. Now the devices are ready and they can be used with a HSUART Virtual Serial Terminal like extraPuTTY. LPC bus is a computer bus used to connect low-bandwidth devices such as serial and parallel ports, PS/2 etc. The Low Pin Count bus, or LPC bus, is a computer bus used on IBM-compatible personal computers to connect low-bandwidth devices to the CPU, such as the boot ROM, "legacy" I/O devices (integrated into a super I/O chip), and Trusted Platform Module (TPM). "Legacy" I/O devices usually include serial and parallel ports, PS/2 keyboard, PS/2 mouse, and floppy disk controller. The LPC bus is available at Pins 24, 25, 26, 27, 28, 29, 30. This Pins can also work as GPIOs if the LPC bus function is disabled in the UEFI BIOS Setup. This is a power sequencing signal. This is used to report that the UDOO X86 is actually turned on and to get off from the reset state all the connected peripherals. For example, if you connect to the board a new peripheral that supports reset state you can connect this Pin to the new peripheral reset pin. This way the new peripheral will be in reset when the board is in a deep suspend state (S3/S4/S5) and out of the reset state when the UDOO X86 is actually turned on, with a considerable power saving. This Pin can't work as GPIO. The I2C (Inter-IC) bus is a bi-directional, two-wire serial bus that provides a communication link between integrated circuits (ICs). Phillips introduced the I2C bus 20 years ago for mass-produced items such as televisions, VCRs, and audio equipment. Today, I2C is the de-facto solution for embedded applications. The I2C 1 is available at Pins 34, 35. The I2C 2 is available at Pins 38, 39. The Pins headers 36, 37, 40, 41, 42, 43, 44, 45, 46 can work as GPIOs only. The GPIO function is enabled by default for these Pins. S/PDIF (Sony/Philips Digital Interface Format) is a type of digital audio interconnect used in consumer audio equipment to output audio over reasonably short distances. The signal is transmitted over either a coaxial cable with RCA connectors or a fibre optic cable with TOSLINK connectors. S/PDIF interconnects components in home theatres and other digital high-fidelity systems. The S/PDIF Output bus is available at Pin 47. To use the S/PDIF bus you need to install a connector type TOSLINK or RCA.